Watching Coraline , directed by Henry Selick on DVD rented from Netflix was an absolute pleasure. The whimsical worlds and characterizations are both gloomy and silly, perfect for a curiously brave child. Coraline Jones (Dakota Fanning) and her parents have recently moved into a new home, divided into different apartments. Coraline is begging for attention from her parents, who are both working on tight deadline to a gardening catalog. At night, she awakes to the sound of a mouse, which she follows to a small door which she found earlier in the day. She enters through the little door to the “Other World” to meet her strangely attentive “Other Mother” and “Other Father”, doppelgangers whose eyes have been replaced by buttons. 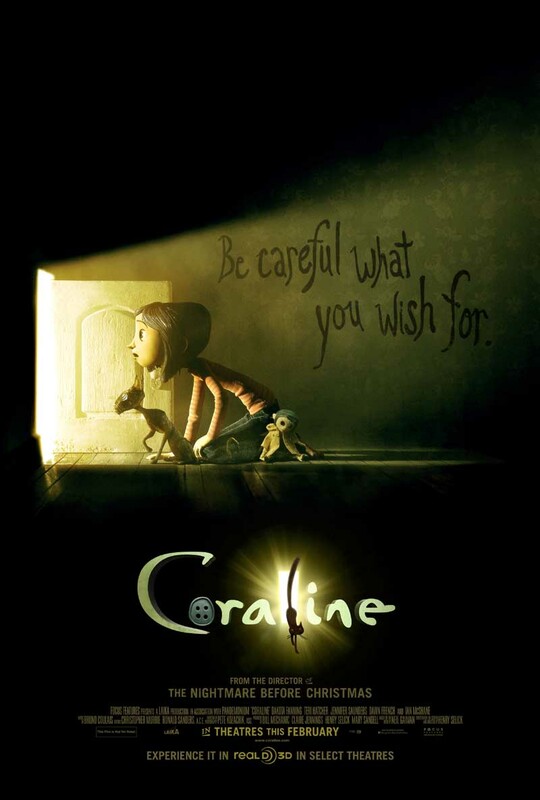 Coraline continues to venture between both worlds until she finds her real parents have disappeared from the real world. 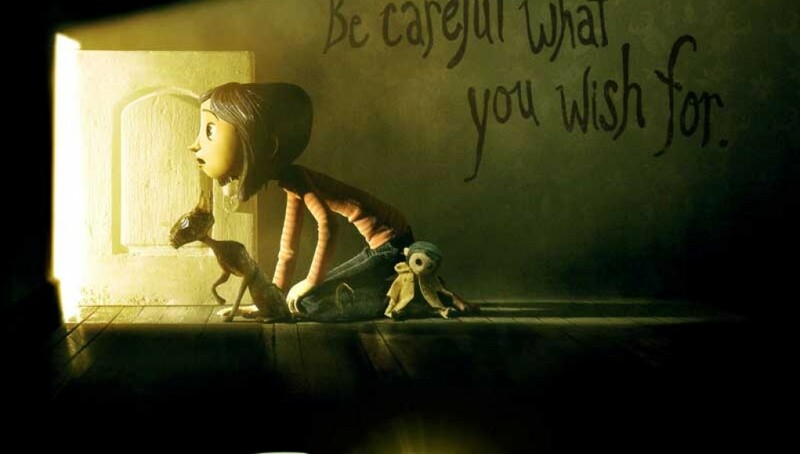 Coraline must now navigate through both worlds to find and save her parents. The stop-motion animation in Coraline is absolutely stunningly fluid and Henry Selick is truly the master and auteur behind this film. While it may not live up to the iconic The Nightmare Before Christmas, Coraline is equally as entertaining. Coraline is the Alice in Wonderland I wish Tim Burton had made; although there are some similar moments, such as the tiny door led to by a rodent. Coraline makes use of stylization from both German Expressionism and New Hollywood. The landscape of the fields behind the apartment building portrays Coraline’s her pre-teen angst and alienation in her new surroundings directly through the drastic scenery. One specific cut where Coraline falls back in her chair, the scene immediately cuts to her falling into her bed, keeping the moving continuity of the character’s direction of falling. This cut and movement very much like The Graduate, another film about the disconnections between a child and their parents. Neil Gaiman’s storytelling is the true moment of brilliance here. His storytelling is imaginative and captivating. Gaiman’s continues his signature of having the real world paralleled with the fantastical world, separated by a minimal obstacle, a small door (Stardust had a stone wall that separates the two worlds). If Coraline stands for anything, it is that Neil Gaiman is one of few novelists whose work translates and adapts well to cinema. Past adapted works include Stardust and Neverwhere, both excellent novels that include many of the signature Gaiman devices and signatures. The cat is another animal in Gaiman’s stories that talks to the protagonist, much like mice in the aforementioned novels. The plot and characters are very similar to that of Hayao Miyazaki’s Spirited Away, also about a little girl who’s parents become victims of curse and their eyes change to mesmerized, darker colors. The film was originally released late-summer on both 2D and correctly filmed 3D formats. This film stands on a thin edge of the necessity of 3D. Coralineseen in standard definition looks great, both vivid and beautiful. The story should receive the same superlatives. How much more could we truly ask for? I did not see this film in 3D, but I want to know, can 3D truly make a film’s visuals and narrative better? Henry Selick left production on Fantastic Mr. Fox to direct Coraline (1), both of which are a shining star in modern animated cinema, as 3D films and CGI appear to run rampant in the theaters. One can only guess how much better Fantastic Mr. Fox could have been if Selick remained. Regardless, both films are gems for modern American cinema. Coraline should be one of those films children can grow up around, one where they can be brave by simply enjoying the stylistic animation and attention grabbing storyline. Gaiman’s Hugo Award-winning novel has been well adapted to the screen, fans may rejoice at Selick’s adaptation, for years to come.